On this page, you will find the answers to the most frequently asked questions, as well as other information not specifically related to course materials adoptions or legislation. If you have any further questions, please don't hesitate to contact us! We are happy to assist! Desk copies are available directly from the publisher but should be requested through your department chair, instructional coordinator, or other designated faculty or staff member in your department. We realize that obtaining a desk copy through the publisher may take some time, so the AACC Bookstore does offer desk copies for temporary use. You will need to bring a completed Account Reimbursement form (available on the Intranet, accessible via the MyAACC Portal) with a proper account number and all authorized signatures to the bookstore in order to receive a temporary desk copy. Incomplete forms will not be accepted. 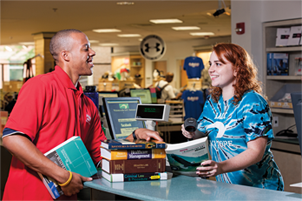 If you need to purchase items from the AACC Bookstore for use in the course of your instruction you may charge the items to your department's account with approval from your department chair and / or budget manager. The process is similar to that for requesting desk copies. A completed Account Reimbursement form with a proper account number and all authorized signatures is required. Please bring the completed form to the bookstore (or, by prior arrangement only, the AMIL or GBTC stores) and we will help you select the materials and merchandise you need. This process also applies to the purchase of AACC Bookstore Gift Cards; please contact Derek Ludwig or Sarah Preis in advance to arrange for the purchase of gift cards via account reimbursement. We carry a wide variety of course-related products including: school, art and engineering supplies; educationally priced software; computers; graphing calculators; uniforms; and study aids. If you know that your students will need specific supplies for your course, please contact Malissa Zindorf with your request. We will be happy to order these supplies for your students, keep copies of your supply lists in our store for student reference, and we can publish your supply list on our Web site upon request. Providing the bookstore with a list of necessary supplies for your course will enable your students to comparison shop for the best price, and allow those students who are using a financial aid book advance direct and prompt access to their needed supplies. The AACC Photo ID, mandatory for all faculty and staff and strongly recommended for students, is produced by the AACC Bookstore. We also maintain photo identification production equipment for the production of ID cards for students participating in clinical and other practicum programs. If you are interested in the use of photo IDs for your department, please contact Derek Ludwig in the AACC Bookstore. Samples of existing badges are available for review with advance appointment. Faculty and staff receive a 10% discount on all general merchandise purchases totaling over $1.00 in the AACC Bookstore. This applies to nearly everything in the store. Food and drink, tradebooks, greeting cards, gifts, sportswear, insignia items, supplies... pretty much everything is eligible for this discount. Some exclusions do apply, however; these are listed on our customer service page. Please check with our sales staff for details before shopping. Celebrate your birthday with the AACC Bookstore and receive 40% off of one normally eligible item! This discount does not stack with the 10% faculty/staff discount. You must visit within 7 calendar days of your birthday (before or after) to be eligible for this discount. Faculty regalia for commencement is available for purchase or rent, beginning in early March of an academic year; you will receive an ordering notice by E-mail. The deadline is usually the first week of April. Wanda El-Shabazz handles both the student and faculty regalia for the store and can answer your questions about regalia. Have you published a literary work or do you have other works for general sale? We want to hear from you! The AACC Bookstore periodically features faculty and staff authors with in-store displays and mentions on our Web site. We would love to make your work available to the college community. Please contact Malissa Zindorf for more information.